ESPN Host Jon Wiener "reported" off of his own speculation that next season Jim Harbaugh would be the head coach of the Indianapolis Colts, reuniting with his star quarterback from Stanford, Andrew Luck. It is absolute blasphemy to suggest that Jim Harbaugh would leave MICHIGAN after one year to go back to the NFL. On top of that, it's horrible journalism to "report" something based off of your own speculation. While on paper Indy looks like a good spot for Harbaugh, he played there, he is a member of their ring of honor, he has two Stanford standouts in Luck and Coby Fleener, and it's a team that can compete for a Super Bowl now. That's all fine and dandy, and if Harbaugh was still in San Francisco this season, I would bet on him making that move, but he's not. 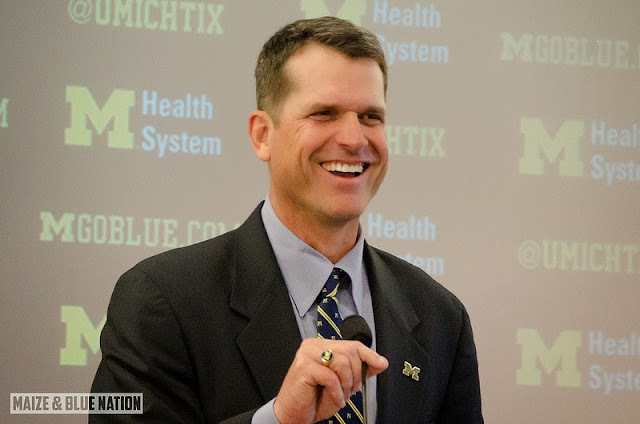 Harbaugh would not leave Michigan after just one season, and I don't expect Harbaugh to leave Michigan anytime soon. There is a good chance that he retires in Ann Arbor. Reporting, speculating, or even thinking that Jim Harbaugh would leave Michigan so quickly after only one year is absurd. It would be like Lane Kiffin in Knoxville all over again, except 1,000 times worse.